Setting sail from various ports in Greece; Americans, Europeans, Arabs, Palestinians and Israelis, Christians, Muslims and Jews, head out towards Gaza to provide humanitarian aid and to express their support for the people of Gaza. Several ships carrying people of diverse ages and professions, including a disproportionate number of reporters, await the call to depart into the Mediterranean. The Israeli government and military oppose this act. Setting sail from various ports in Greece; Americans, Europeans, Arabs, Palestinians and Israelis, Christians, Muslims and Jews, head out towards Gaza to provide humanitarian aid and to express their support for the people of Gaza. Several ships carrying people of diverse ages and professions, including a disproportionate number of reporters, await the call to depart into the Mediterranean. The Israeli government and military oppose this act. They view this as a challenge to their sovereignty over the sea, over the waters that lie in front of their shores (as each Mediterranean country claims control over their part of the sea). Yet the organizers of the Gaza flotilla insist on arrival by sea. They initially argue for the need to allow the humanitarian supplies to reach the people under naval blockade. Later, with the intervention of the UN Secretary General, the Greek offer the flotilla organizers a compromise - to redirect the humanitarian aid from the flotilla ships onto vessels of the Greek government to be transferred to Gaza via the Ashdod port (Israel) or Arish port (Egypt) and further transported by land from either of these to Gaza under supervision of Greek and UN authorities. The flotilla organizers decline the offer—they insist on arriving directly to the port of Gaza via the sea. Their mission calls for Gaza’s right of access, as well as their own right to the sea. 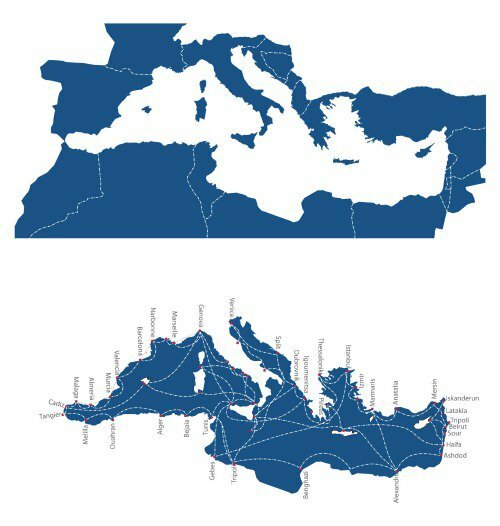 Union of Mediterranean nations (top), which extends beyond the Mediterranean, versus network of port cities (bottom) which focuses on the sea as common space. The flotilla is an international, independently organized political protest. Although the ships might be carrying supplies essential to the people of Gaza, their raison d’être is to show solidarity. Perhaps what has been guiding the flotilla organizers is a romantic, naïve notion of sailing the sea, of bygone times when the waters of the Mediterranean were carriers of cultural and political ideas. Yet what message can a few civilian boats carry today, in an age of much more powerful means of communication and protest? Why this insistence to traverse the sea? And what does the sea, particularly the Mediterranean, represent to the local parties involved and to the global spectators? The flotilla story not only exposes some of the region’s conflicts and political intricacies; it also reveals the potential of the Mediterranean Sea to provide an alternative common ground to a region caught in a deadlock of nation-state limitations, conflicts and wars. The Mediterranean is often referred to as the cradle of western civilization; throughout human history its peoples, cultures and cities have impacted and inspired societies all around the world. Many have proclaimed that the humane notion of 'man as the measure of all things' could only have emerged along the shores of the Mediterranean. This notion has been derived from the Mediterranean’s historic role and physical characteristics. The sea's unique geographic and oceanographic qualities--relatively calm waters, small tide fluctuations, predictable wind patterns, richness and ease of fishing and the variety of protected natural bays at a human scale--offered good conditions for human habitat and allowed abundant exchange of populations, goods and ideas. For centuries the sea played a central part in the livelihood of the peoples and civilizations surrounding it. It played a crucial role in the perception of space and the continents which meet it. Myth and legend enhanced the cultural aspect of the sea as a territory of its own, triggering the imagination of artists, poets, statesmen, emperors and pirates. From the times of the Greek, Roman, Arab and Ottoman empires, the Mediterranean Sea has been rendered in maps as the area’s single common element that holds everything around it in place, as a figure shaped by its unifying role. To this day, viewing the shores of the Mediterranean from within the sea has a surprisingly unifying effect. Waterfront cities of different countries, identities and populations appear so similar to the extent that one cannot distinguish between their nationalities. The overarching power of the sea’s horizon creates an experience of a continuous space where cities are unified by a horizontal datum line that cuts across territorial borders, nationalities, histories and faith. Beirut, Tel Aviv, Ancona, Tripoli, for example, while politically distinct entities, appear like siblings. The view from the sea reveals commonalities at the larger regional scale: both man-made and natural, both reoccurring human settlement patterns and aspects of the environment – vegetation, landform and climate. Diversity, though abundant and close at hand falls within the range of the familiar, primarily as a result of a common scale of nature - a scale which is defined as much by the sea as by its lands. The region’s modern history, as well as its present, is characterized by the abandonment of trade routes and the implosion of urban centres. Current studies (Plan Bleu -Environment and Development in the Mediterranean) estimate that about 40% of the Mediterranean coast has already been interfered with by infrastructure, roads, tourist facilities, or other forms of urban development. Projections foresee an additional 200km of build-up area per year, leading to a loss of 3,000km of natural coastal areas by 2025. While uncontrolled urban sprawl continues to grow along the coast, the Mediterranean Sea itself remains a desolate place. Even though its framing 'view' continues to be romanticized and marketed, its inherent role as mediator has all but disappeared. It makes the news infrequently and sporadically, only whenever a refugee ship disappears or when its resources are put under dispute. Yet, increasingly, there are important reasons to re-establish the sea as a collective space. Establishing the sea as such a space will enable cooperative efforts in addressing environmental and ecological dangers, coordinating, managing and maximizing the benefits of its growing cargo activity, and advancing regional tourism. The sea had already seen a steady decline in influence in the last century, when nation-state ideologies in the region were significantly enhanced, further diminishing its role and severing ties between the people occupying its perimeter. While in many cases the different countries occupying the sea developed tourist destinations along it, from an urban perspective, it can be said that these developments often turned their back towards the sea. The seafront became a space of two extreme urban edge conditions: ports as service entrances and backyards of the city, and tourist retreats in the non-industrialized areas. Both these uses function in isolation from the city behind them, in many places creating a gated and controlled waterfront which does not interact with everyday urban life. A map depicting the twenty seven countries lining the Mediterranean Basin is the emblem of French president Nicolas Sarkozy’s proposal to create a “Union of the Mediterranean,” modeled after the European Union. This map reveals not only the plan’s political aspirations but also its problems. Many of the union’s proposed countries, as shown on the map, extend geographically and culturally far beyond the Mediterranean and so would inevitably bring into the partnership national, political and economic issues which are not necessarily tied to the Mediterranean as a region. Beginning in 2008, Sarkozy began a series of excursions to the leaders of the countries aligning the sea, particularly from the south, in order to promote the plan. France situated itself as the country that could best serve as a bridge between the North African and Middle East countries of the Arab world and the Europeans who share the northern parts of the sea. Yet this version of a Mediterranean union of nations was doomed for failure even before it took shape. Its inevitable collapse was due to its overly ambitious intentions, its misreading of the power of cultural, religious and socio-political gaps that lie between potential member nations, and unforeseen events, such as the Arab Spring of 2010. Furthermore it aspired not just to resolve conflicts around the Mediterranean but also to mediate large gaps between the Arab Islamic south and the Euro-Christian north. The much publicized objections from other EU members against this union (and against France’s lead) also contributed to its failure. Sarkozy’s concept of a Mediterranean Union, modeled after the European Union, was too embedded in a modernist ideology that envisioned a new Mediterranean based on the full participation of its nations. In that aspect it resembled Shimon Peres’s vision of a new Middle East. Both can be associated with a political agenda of imposing a new order, a new reality which is to replace the existing. The Mediterranean waters offer a different ideology, a different organizational logic. In it we decipher a network of connections in which the Mediterranean Sea becomes the medium which empowers its port cities and contests the nation-state’s inability to exploit cross-border ecological, social and economic interests. Establishing an alliance based on the participation of cities, rather than of nations, can help concentrate efforts in developing and revitalizing old and existing ports as part of a regional system of tourism, commerce, office and industry. The growing understanding of the sea as a shared resource which needs to be protected and better managed, encourages a new regional urbanism: a network of seabound cities linked through waterways, shared facilities, shared energy, regional planning initiatives and more. 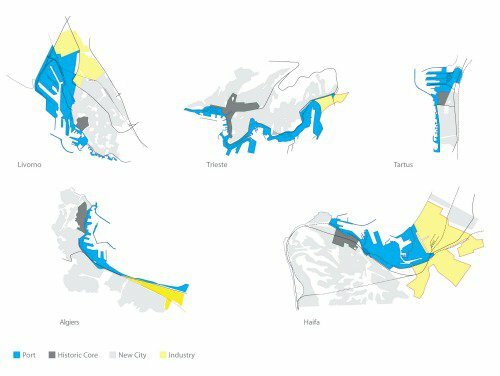 These seabound-cities re-embrace their port, which becomes a generator of sustainable urban development both inland and towards the sea. An alliance of Mediterranean port cities would not seek to replace the current nation-state order but rather provide a system that would operate in parallel, favoring the notion of Civicism where citizenship is based on the city level, over that of nationalities and national identities. Regional and international trade have already established cross border ties for many Mediterranean port cities, but these can be much further developed. What is more, the inherent features of these port cities - they are mostly secular, devoid of religious sites or significance, multi-cultural and ethnically diverse with a strong immigrant presence - have historically made them more tolerant to the other, make them better suited to take part in a regional system. Port cities hold the key to the region’s future economic prosperity. The exportation of European industries to the Asian markets and the continued reliance on Africa to supply products and materials for many of Europe’s existing industry has led to an increase in cargo activity in the Mediterranean. European demand for consumer goods has not diminished, even as more and more of production has been taking place outside of Europe. Goods are finding their way back to Europe, primarily via shipping. Other means of transportation such as air travel or truck transport are limited - both in terms of the capacity as well as reliability of routes - and are becoming more congested and expensive. Rail is still an essential carrier, yet meets too many geographic, technical and political obstacles in crossing between countries. The natural qualities of the Mediterranean Basin, particularly its geography and the existing port infrastructure make shipping the most preferable means of transport. 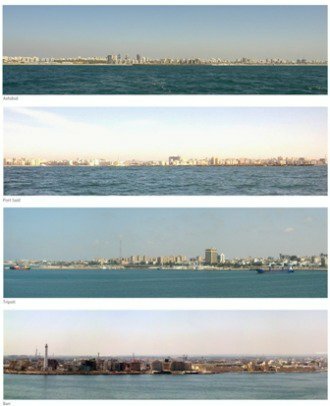 Additionally, the continuous rise in both population density and industrialization along most of the Mediterranean’s shoreline has led to considerable environmental challenges. Increasingly evident in nearly every sub-region in the Mediterranean Basin, these challenges are particularly acute in three fields: Pollution from land based activities – associated with the disposal of persistent toxic substances into the waters of the Mediterranean; management of coastal aquifers – a result of constant over-extraction and degradation of groundwater along the shores of the Mediterranean; and conservation of biological diversity – an effort to maintain the long-term functioning of the Mediterranean large marine ecosystem. As these challenges are shared by the entire region, successful mitigation of any and all of them requires a sound framework for collaboration. Since many of the Mediterranean ports predate post WWII urban sprawl, they are almost always strategically located adjacent to both the older and newer parts of the city. They occupy a relatively large area in the city and contain significant and diverse infrastructure: shipping facilities, rail, truck access, and industry which in many cases have disappeared and left behind empty industrial structures and underutilized buildings. Yet in spite of the proximity to the waterfront, much of the real estate adjacent to the ports is not as desirable as one would imagine. From an urban point of view, ports have been kept out of the city (in part for security and safety measures) as large non-access zones of single infrastructural use. Architecture and urbanism can re-imagine the relationship between the port and the city. Establishing a network of port cities can allow the upgrading and development of infrastructure to become more efficient and at the same time liberate space for other programs. Planning principles would be guided by the demands and requirement of the regional network in addition to those of the individual countries. A primary outcome of such a strategy on these port cities would be an increase in tourism and the movement of peoples for work purposes. As the Mediterranean ports begin to allow new programmes and local, regional and international industries to enter at the forefront of the city, they will call forth other seabound city dwellers to say - the sea is open, the city, our captain, awaits.